A fair portion of any JRPG soundtrack is made up of themes that are tied to places, characters, or events. In each Final Fantasy since FFIV, for example, each character has had an individual theme that is played during events in the plot that involve that character. Likewise, just about every town (and many of the dungeons) have individual themes, a trend that’s not unique to Final Fantasy but appears in most JRPGs. At least a certain portion of each game’s score, however, is dedicated to unique plot events–specific battles, cinematic sequences, dramatic moments. Often, when a battle theme is unique, it denotes a particularly difficult or climactic boss–see Chrono Trigger’s “Battle with Magus,” Suikoden II’s “Gothic Neclord,” or Lunar: Silver Star Story Complete’s “Magical Weapon Nash” (a personal favorite–obscure!). Final Fantasy IX has a unique battle theme accompanying a fight that isn’t particularly climactic or dramatic–at least, not in the traditional sense. “Feel My Blade” gets played exactly once in the game, within the first hour, and it accompanies the battle between Zidane’s acting troupe, Tantalus, and… their boss, Baku, who is playing the role of the evil king in the play that they’re performing. The battle has no actual dramatic tension–you can’t really lose it–and in fact, in place of the “Magic” command in your characters’ menus, you can select “SFX,” a command which allows you to use a number of unique “spells” that are entirely for spectacle and which deal exactly zero damage. You’re putting on a show for the audience in much the same way that the game is putting on a show for you. This is a sequence which is easy pickings for the crowd who decries Final Fantasy as being mostly cutscenes with minimal gameplay, but if you’re among those gamers who appreciate games as spectacle and don’t mind narrative being sometimes divorced from game mechanics, the whole thing is hugely delightful. In fact, the whole game is pretty delightful. I love this track–the swashbuckling, heroic melody, the length, melodramatic introduction–all of it. Tracks like this make me lament, in part, the advent of voice acting in RPGs. In the 32-bit era and before, the score of a game was entirely tasked with carrying the emotional tone of a scene, and could do so unimpeded. We’re still getting brilliant game music, of course, but “Feel My Blade” belongs to quite a different era, an era for which I feel a great deal of nostalgia. It’s NaNoWriMo time, and that means it’s time for me to assemble my yearly writing playlist. Based on the tune I’m offering here, go ahead and take a guess at the tone of my piece this year. Xenogears is one of the most brilliant and most flawed games I’ve ever played. When it was initially released, it was among the most technically and visually impressive games available for consoles, and certainly the JRPG with the greatest scope–beating out even the biggest Final Fantasies. (It probably still doesn’t stack up against the Baldur’s Gates and Planescape: Torment, but hey). I’m always hesitant when I consider recommending that someone try and play through Xenogears. If you can cope with its pace, its difficulty, the often awkward and dull translation, and the fact that the game is essentially unfinished–the second disc is like an outline for what the developers envisioned the rest of the game ought to be–it’s one of the most thoughtfully created and emotionally resonant games out there. It’s a game that legitimately tries to tell a mature story, though the telling of that story is hampered by a number of factors. Recommending Xenogears is kind of like recommending someone tackle Ulysses–if they can glean from it the brilliant and remarkable insights present within the text, there’s little that can compare with the experience. There’s just an awful lot to slog through in order to reach those jewels. But seriously, though. You should totally play it. I think that a big part of my desire to be “well played” (that is, to have played many historically and culturally important games on many different systems) comes from the fact that my console allegiances shifted a number of times when I was young. I began gaming on a Nintendo Game Boy when I was six, but as I’ve previously mentioned, this was a gift from my extended family–I didn’t really choose it. So too with the Sega Genesis I received when I was nine. At this point I didn’t have a preference between the two companies, Sega and Nintendo– I certainly was glad to have a Game Boy rather than a Game Gear, because I enjoyed being able to play my handheld for more than twenty or thirty minutes before it ran out of batteries–but I was quite content with my Sega Genesis, and didn’t feel like I was missing out by not owning an SNES (it turns out I was wrong): I might have the inferior TMNT game, but I had the better version of Aladdin, after all. Something happened when it came time to move on to the 32/64-bit generation, however, and it’s worth recounting here as an anecdote, because a chance of fate conspired to shift my allegiances once again. 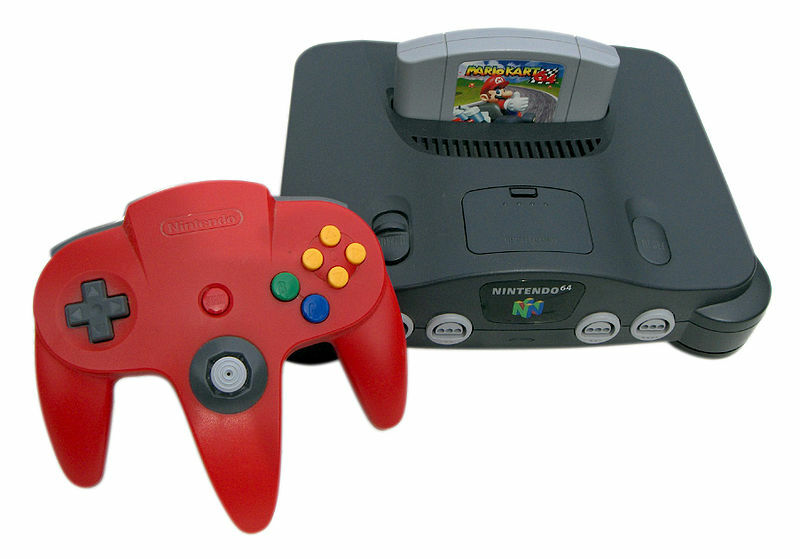 It was the holiday season of 1996, and the new consoles had been out for somewhere between a few months and a year. I felt as though it was time to move on from my Genesis and embrace the world of the new. Knowing that my parents had a firm policy against buying me systems, I understood that it was going to take not just my savings, but the sacrifice of my trusty Sega console and all of its games, plus all of the birthday money my grandmother had given me, I wistfully gathered up my gaming collection and asked my father to take me round to the mall so that I could make my purchase. So when I rolled up with my father to the CD Game Exchange my little cardboard box containing the remnants of the hedgehog’s 16-bit kingdom, I had my sights firmly set on a January exploring the hallways of Peach’s castle. The plumber exhorted me to “let’s-a go,” and I was ready to obey. I set my old games on the counter in front of a young man who I imagine was in his early 20s. I have no recollection of what he looked like, now, which is unfortunate, considering the effect that he was about to have on my life as a gamer. The dude calculated how much trade in value I would get for my old gear, and as he reported the number to me I remember smiling to myself. It was just enough that with my additional savings, I would be able to purchase the system–and a game besides! I rubbed my hands together in naive anticipation. I can’t say for sure, but it’s entirely likely that my lip trembled. Why was the universe intent on crushing my tiny gamer dreams? And it was at this point that the man leaned over the counter and beckoned me closer with a crooked finger. Desperate for any glimmer of hope, I approached once more, hoping that he was about to tell me that there was just one system left, in the back, and he just wanted to make sure it went home with a boy who really wanted it. He looked at me and the corner of his mouth bent upward in a smirk. He leaned in conspiratorially, as though he was about to impart to me some secret of the Adult Gamer World. And you know what? I did. Looking back on it, I’m certain that he was just trying to make a sale, that he was thinking of how nice it would be to make his numbers go up on that little board in the back room, but I bought it hook, line, and sinker. I couldn’t explain why, but I knew that I did want a PlayStation. And so I handed over my Genesis and my Sonic 3D Blast and my Ristar and my Jurassic Park: Rampage Edition and a dozen other games, and I left the store with a brand new Sony PlayStation. I couldn’t deal with the notion of leaving that store without a new system in hand, and so I, I took the road less traveled by, and that has made all the difference. Actually, strictly speaking, the PlayStation ended up selling about three times as many units as the N64, so I really took the road more frequently traveled by. The games I bought immediately were actually kind of lame: I went home with Ridge Racer Revolution, which was a decent game but only had three tracks, and this business, which, seriously, what the hell. Somehow I wasn’t deterred or disillusioned by my purchase, despite– well, despite the fact that Aquanaut’s Holiday was really boring. The system came with a demo disc that had some excellent suggestions, and pretty soon I was jamming out with Jumping Flash 2 and Jet Moto, two games which have aged really well and which I would still recommend. But it wasn’t until later that year that I truly realized how right that CD Game Exchange worker had been. I saw an ad in my gaming magazine (the now-defunct Next Generation), desperately begged my mom to take me to the mall after school, and came home to rush to the basement, pop in the disc, turn on the console, and see this. When I finally managed to pick my jaw up off the floor, I said a little prayer of thanks to that guy at CD Game Exchange, because it became clear to me in that moment that he had not been just messing with me to make a sale. He’d been genuinely concerned with my well-being as a gamer.